Difference between OIM , OAM And OID ? 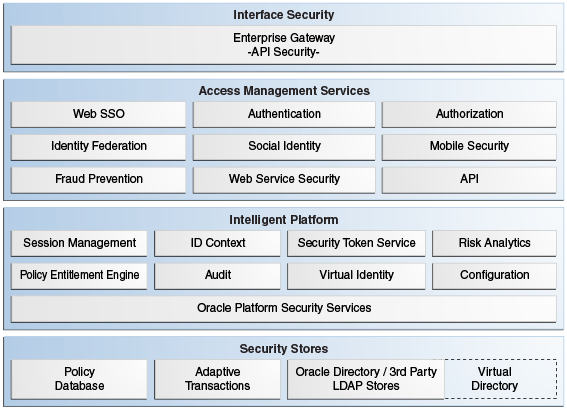 Oracle Access Management is a Java, Enterprise Edition (Java EE)-based enterprise-level security application that provides a full range of Web-perimeter security functions and Web single sign-on services including identity context, authentication and authorization; policy administration; testing; logging; auditing; and more. It leverages shared platform services including session management, Identity Context, risk analytic, and auditing, and provides restricted access to confidential information. From the above picture as you see OAM provides single point to control all resource grants in an enterprise where multiple applications exist on different platform. You can refer to oracle Doc here. There is more but you can refer to the above documentation. enables enterprises to manage the entire user life cycle across all enterprise resources both within and beyond a firewall. An Oracle identity management solution provides a mechanism for implementing the user management aspects of a corporate policy. It can also be a means to audit users and their access privileges. The best best example to understand OIM is employee. Finally OID : Oracle Internet Directory. Information about shared resources such as conference rooms and printers. The information in the directory is available to different clients, such as single sign-on solutions, email clients, and database applications. Clients communicate with a directory server by means of the Lightweight Directory Access Protocol (LDAP). Oracle Internet Directory is an LDAP directory that uses an Oracle Database for storage.